The textile mills are well aware that the cutters in an automatic winder, like the splicer cutters, the EYC cutters, the magazine yarn cutter, etc continuously perform the yarn cutting function. For example the EYC cutter has to perform on an average of 5 lakh Yarn cuts/Year with the approximate cut rate of 80 cuts/100km. These are heavy duty stuff and an improper cut or no cut will result in a tail end defect or double yarn defect. So it is important for the textile mills to monitor closely the cutters and scissors on an automatic winder and replace these cutters or recondition the cutters whenever the edges get blunt. This type of cutters are made of high hardened steel which gives the cutters a life of at least 3 years. 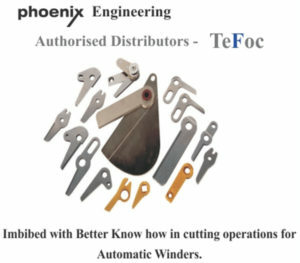 For mills who replace the cutters on one full winder a performance guarantee of 3 years is offered. This type of cutters is made of steel with brazed tip. These tips enhances the accuracy of cutting edge & maintain its effectiveness throughout the life of at least 5 years. A performance guarantee of 5 years assured life will be given for a complete set replacement. These types of cutters are highly preferred for coarse & blended yarns. ceramic blades are rust proof & it is widely supplied for all Murata make Autoconers. If properly handled ceramic cutters gives the longest life. For mills who have winders more than 5 years old and with frequent issues with cutters and scissors request to send their enquiries to us for replacing these parts so as to maintain a trouble-free working of the automatic winders and maintain a consistent yarn quality.